Forty days after His Resurrection from the dead and before the eyes of his closest followers, our Blessed Lord ascended body and soul into heaven. But what does “ascended” mean? Every year, on 15th August, we celebrate a different Feast, the Assumption of Our Lady into Heaven. 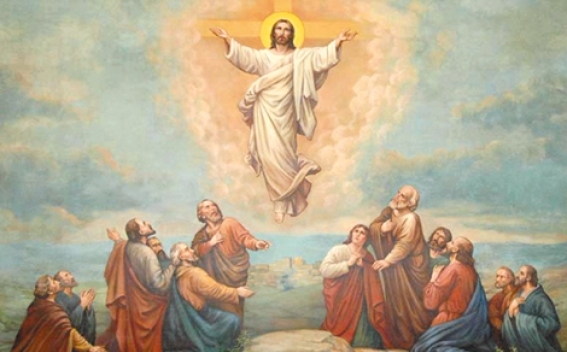 Notice the difference, today’s Feast is the Ascension, the 15th August is the Assumption. Christ ascends, Mary is assumed. The difference is important. Christ’s Ascension reveals His divinity as did His Resurrection. Throughout the history of salvation, many people have been raised or raised others from the dead with the help of God’s power. But only Christ rose from the dead on his own. Christ, as true God, holds power over life and death, He is omnipotent, all-powerful, “almighty” as we say in the Creed each week. As true man, Jesus used that omnipotence to conquer death for our sake, to win our salvation, to redeem us. By bringing redeemed human nature up into Heaven, He showed that along with being all-powerful, He is also all-good, all-loving. The Ascension of the Lord reminds us that there is no limit to the confidence we can have in God because there is no limit to his power and goodness. Reflecting on this great mystery of faith, we feel ought to feel our confidence in God renewed and strengthened. Our Lord rules history right now. Although it can be difficult for us to understand how He is at work in all things; nothing is outside his knowledge and power. None of the difficulties, injustices, and problems that we face as individuals, families, or societies – nothing is beyond Him. This week, while we mourn all who have died at the hands of evil-doers, we know that the mercy of God can heal hearts that have been wounded by sin and evil. We know that he entrusted his mission to those that he left behind as he ascended into heaven. “you will be able to be my witnesses in Jerusalem, all over Judea and Samaria, even to the ends of the world.” That mission is entrusted to us today. We may not go to the ends of the world, but we can take it to our places of work, our daily lives, and our families. If we follow Christ and help others to do the same, we will fulfil our part. Let us strive to show the love of God to all we meet in our lives, even “to the ends of the world” that they may find his peace and love. Grant, almighty God, that we, who believe your only begotten Son, our Redeemer, to have ascended on this day into heaven, may also ourselves dwell in mind amid heavenly things. Through the same Jesus Christ, your Son, our Lord, Who lives and reigns with you in the unity of the Holy Spirit, forever and ever. Amen. 14-16 Still later, as the Eleven were eating supper, [Jesus] appeared and took them to task most severely for their stubborn unbelief, refusing to believe those who had seen him raised up. Then he said, “Go into the world. Go everywhere and announce the Message of God’s good news to one and all. Whoever believes and is baptized is saved; whoever refuses to believe is damned. 19-20 Then the Master Jesus, after briefing them, was taken up to heaven, and he sat down beside God in the place of honor. And the disciples went everywhere preaching, the Master working right with them, validating the Message with indisputable evidence. The Readings from The Message are those set for the Feast of the Ascension in Missale Romanum, 1962.